Dissecting cow eyeballs, maneuvering robots and investigating a dramatized crime scene are just a few of the hands-on activities that bring all ages to the annual STEMfest, one of Northern Illinois University’s most popular events. From 10 a.m. to 5 p.m. Saturday, Oct. 27, at the NIU Convocation Center, NIU departments and student groups, regional corporations, museums, educators and national labs will team up to offer more than 200 science-, technology-, engineering- and math-related (STEM) activities at this free, family-friendly festival. 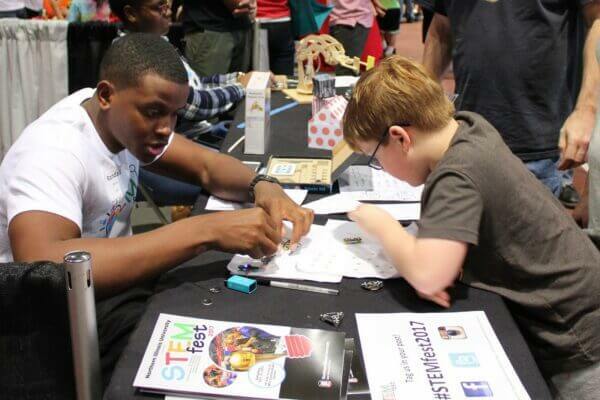 Entering its ninth year, STEMfest draws huge crowds because of its fun interactive activities. Visitors will have a chance to explore the Haunted Physics Lab, examine cell cultures under a microscope, and launch a weather balloon with NIU’s Department of Geographic and Atmospheric Sciences. The STEMfest organizers are still seeking NIU departments and student organizations who wish to share their STEM-related activity. Register for a booth (free for NIU organizations) by the Tuesday, Oct. 2 deadline. Watt says he is particularly looking forward to some of the new exhibits that will debut this year, such as an interactive art studio where visitors can decorate a floor with UV reactive paint, which glows under a black light. Another exhibit he’s looking forward to is a working aluminum foundry. Speaking of creative sides, this year will also mark the first Northern Illinois Mini Maker Faire, which will be held in conjunction with STEMfest. Visitors are invited to explore both events, which together celebrate ingenuity, creativity and experimentation. Makers are encouraged to register for a booth. What is a Mini Maker Faire? It is a gathering of people who make things—from crafters to programmers, fiber artists to engineers. The Maker Faire offers a chance for anyone who applies their ingenuity to make or build things to share their hobby or passion with others. The STEMfest website contains information for visitors, exhibitors, potential volunteers and sponsors, as well as information about scout and youth group activities. This family-friendly event is free and open to the public. No registration is required, and parking is free. Most of the exhibits are completely free, but books, T-shirts, electronic kits and other STEM-related items will be for sale.